Fix FTDI DMX interface & Arduino on OSX 10.9+ Mavericks - Steven B.
Apple recently decided to make their own FTDI driver with the release of OSX 10.9 Mavericks. This broke compatibility with Arduino & USB DMX interfaces based on an FTDI chip. Here is how to disable the new driver and use the old FTDI driver. All your apps will be working again like they should. Fill in your password and click “Ok”. Your Mavericks driver is now Disabled and your software should work again. This entry was posted in Arduino, Sound&Light and tagged 10.10, 10.11, 10.12, 10.13, 10.9.0, 10.9.1, 10.9.2, 10.9.3, arduino, d-pro, disable, dmx, dmxis, driver, duamilanove, enttec, enttec open dmx, fix, ftdi, guide, help, imac, kext, mac, mac pro, macbook pro, mavericks, not working, qlc, show buddy, tutorial, yosemite. Bookmark the permalink. This fix the OpenDMX alright. But i must share my experience using QLC+ with a Emtec OpenDMX in one USB port and an Arduino in other USB port. I could only use one device with this fix. Arduino updated their program for the new mac driver, the DMX software did not update their software… so arduino will only work with the new driver and DMX will only work with the old driver. as long as QLC and other DMX software does not update their software, you will always have to switch between drivers. 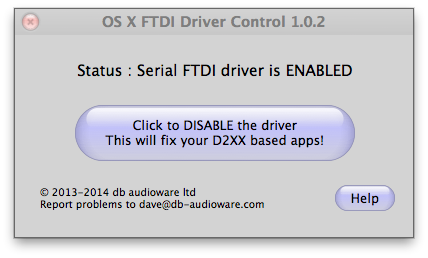 This fix does not seem to work on Yosemite it seems to disable Apple’s FTDI Driver but new FTDI driver does not work? haven’t tried on my Yosemite yet, I’ll try and report back to you. Doesn’t work on the latest Mac OS X Yosemite DP build. Did you find solution to fix it? Stil working on the Golden Master of Yosemite. you don’t need the terminal for this guide… just drag & drop the app in your application folder, run the app and click the button. Yes, My macbook can’t find the interface. In that application it just says: Status: Serial FTDI driver not found on system. not sure why that is, you could check “about my mac” and than system… under the USB tab. is there a ftdi device? It seems to be a problem with QLC+. I was reading your other topic about the ethernet interface and saw something about the ‘JV Lightning DMXcontrol software. With this software, the interface is at least working on OSX.